£12.49 £10.99 postage paid World-wide. Vasily Petrenko (b. 1976) has been leading the Royal Liverpool Philharmonic Orchestra since September 2006 and has recently extended his contract until at least 2015. His work on Merseyside has been drawing many very enthusiastic notices, including several on MusicWeb International. However, until now, with the exception of his recording of Sir John Tavener’s recent Requiem (see review) I’ve not heard any of his performances. If this thrilling disc is anything to go by then I’ve been missing something. I’ve long thought that Rachmaninov’s Symphonic Dances ranks among his finest works but this new recording really made me sit up and take fresh notice. For that Petrenko and his orchestra must take a huge amount of credit. However, the quality of the recording itself also has much to do with it. I can only describe the sound on this CD as stunning. By chance, immediately before I put this new Avie disc in my player I’d been listening to Vladimir Ashkenazy’s 1983 Decca recording of Symphonic Dances and The Isle of the Dead. Those are extremely fine performances, splendidly recorded by Decca in the Concertgebouw in Amsterdam. On that disc the sound is warm, yet very clear and there’s a good deal of space round the orchestra – I strongly suspect the orchestra was set out on the auditorium floor in the empty Concertgebouw. This Avie recording offers a very different experience for the sound is closer – though not oppressively so – and very present. Producer John Fraser and Engineer David A. Pigott have produced here one of the best recordings of a symphony orchestra that I’ve heard in a very long time. The orchestra is, as I said, very present yet very natural also. The recording offers a wide side-to-side perspective and also very good front-to-back definition. There’s an abundance of detail to hear – the percussion thrillingly reported and the brass impressive without ever sounding domineering – yet without any sense of artificial spotlighting of sections or individual instruments. With a satisfyingly rich bass foundation and an impressive dynamic range this recording presents the orchestra in a most exciting and very musical way. The sound has terrific definition, not least in the quiet passages, and packs a real punch at climaxes. Best of all, the recording lets you hear just how impressive the performances are. For the orchestra there are few hiding places in Symphonic Dances, especially when the sound is as clear and detailed as this, but the RLPO are consistently sure-footed. The quality of the recording and Petrenko’s care over balance got my attention from the first bars of Symphonic Dances. The very opening is light, crisp and delicate after which the bold string chords have a most impressive weight. Petrenko drives the music forward with vigour but never overplays his hand. The saxophone solo (from 3:26) is lovingly phrased, imparting just the right feeling of wistful nostalgia. In the succeeding passage (to 5:46) there’s some excellent woodwind playing – and not for the last time on this disc, either. When the strings take up the melody it sings gloriously – and between them Petrenko and the engineers balance the accompaniment of harp and piano perfectly. The eventual return to the movement’s opening material is at first suspenseful and then very exciting. Rachmaninov’s self-quotation from his First Symphony is warmly delivered but without any over-indulgence. If I have a small criticism it concerns the brevity of the gaps between the movements. There’s a mere two seconds between the first and second dances – the Ashkenazy disc has some six seconds – and only three seconds between the second and third movements. Just a little more time would have been welcome. The second movement is a spectral, awkward waltz: in the memorable phrase of annotator Anthony Bateman “Evening has brought its ghosts”. Petrenko shapes the music with great imagination, conjuring up for this listener at least an image of a dimly lit and faded ballroom that has rather gone to seed. The RLPO strings play splendidly, with plenty of body to their tone – and their woodwind colleagues offer equally fine playing. Petrenko is alive to all the nuances and subtle inflections of Rachmaninov’s music. His is a colourful and well-imagined reading and he draws really responsive playing from his orchestra. Among many details that I relished is the nutty tone of the violas between 7:05 and 7:23 followed by the sound of really hushed violins and a doleful bassoon. Once Petrenko reaches the main material of the third dance his reading has abundant energy but, rightly, there’s more than a sense of foreboding as well. As a sample of the impressive way in which soft passages are handled, sample the rather sinister passage introduced by the bass clarinet (5:04). Shortly afterwards (6:60 – 9:55) the long, brooding string paragraph, in which the RLPO players excel, is surely Rachmaninov revisiting his Second Symphony but with a melancholy air, knowing that those days are gone for ever. In the last five or six minutes Petrenko urges his players on to an exciting yet darkly-tinged conclusion. In these pages the tambourine, tam-tam and xylophone contributions are magnificently caught by the microphones and the dramatic last few bars bring a superb performance of the work to a tumultuous conclusion. Recently, I was greatly taken with a live performance of The Isle of the Dead conducted by Evgeny Svetlanov (see review). I found that reading enthralling but its very expansiveness probably courts controversy and will not be to all tastes. Petrenko’s reading is more mainstream, if I may put it that way, in terms of pacing. His account, at 20:58. lasts for almost the same time as Ashkenazy’s (20:52) and is similar in length to several other recordings on my shelves. Mind you, it is salutary to note that the composer’s own 1929 recording with the Philadelphia Orchestra lasts a “mere” 18:05 and even after eighty years that recording still sounds well – and packs a real interpretative punch! Petrenko isn’t in the Svetlanov league when it comes to expansiveness but his interpretation is still full of brooding power – and his performance affords better playing than we hear on the Svetlanov disc and, as you’d expect, comes in much better sound. This Liverpool account establishes a very potent atmosphere right from the outset. There’s dark grandeur in the playing – and in Petrenko’s conception of the work. As in Symphonic Dances the excellence of the sound supports Petrenko’s balancing of the orchestra magnificently. Between 7:22 and 7:44, for example, the balance between the cello tune and the woodwind decoration round it is outstandingly successful. Later on (8:04 – 9:40) the ear is impressed mightily by sonorous brass, pounding timpani and weighty strings. Petrenko builds the piece to an impressive and potent central climax, thrillingly reported by the recording, but the way he winds the tension down in the following bars is just as noteworthy. Later on, he invests the urgent, surging string passage (11:23 - 12:59) with real ardour and the main climax of the piece (around 15:30) is shattering in its intensity. As Charon, the boatman, rows back across the Styx from the Isle, his work done for now, the opening music returns and Petrenko controls the sombre conclusion very effectively. In a way I wish the disc had ended there; the piece that’s placed last would have been a more satisfying opener, I believe. The Rock is a youthful work but a significant achievement nonetheless by the twenty-year-old composer. Apparently Tchaikovsky admired the piece and it’s not hard to see why for the scoring is attractive and the invention is strong. For much of its course the nature of the music is much lighter than that of the other two works on the disc. Petrenko conducts with grace and affection but also does the powerful stretches towards the end very well. In the first few minutes the principal flute, Cormac Henry, has a lot of demanding solo work and he shines under the spotlight that Rachmaninov trains on him. Another example of finesse that caught my ear was the exquisite passage of string tremolandi between 7:04 and 7:39 – it’s details such as this that puts the stamp of distinction on this release. As a piece The Rock may not be the equal of the other works on this disc but it has many attractions and it receives a very fine performance here. As I hope I’ve conveyed, this is an exceptional disc in every way. It’s one that I’ve enjoyed enormously but I also admire it greatly as an achievement both on the part of the musicians and of the engineers. 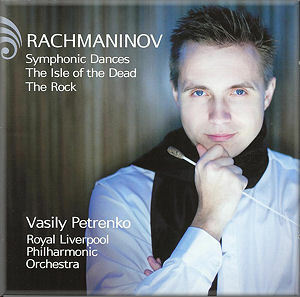 If you’ve wondered why so much fuss is being made about the work that Vasily Petrenko is doing with the RLPO then this superb CD should provide the answer. Already, in early February, this disc is on my shortlist of Recordings of the Year. One final thought. Could Avie be persuaded to record this team in Rachmaninov’s Second Symphony? If Petrenko and the RLPO could recapture in a recording of that great, sweeping symphony the form shown on this disc then the result would be a serious challenge to the longstanding hegemony of André Previn’s 1973 recording with the LSO (EMI). Meanwhile, don’t wait to see if that disc appears. Buy this one – now! I doubt you’ll regret it and I hope it will excite you as much as it has excited me. Petrenko is quite the star. Young, handsome, rejecting the holy shibboleths of concert programme construction, idolised, his reputation and following echo that of the young Stokowski. His image stares down from advertising hoardings in Merseyside as if he were a pop star. Is he a construct of the media or is there substance there as well? Having heard his recordings and revelled in the RLPO concert in which he included Rachmaninov's The Bells I am sure that he is more than a mere media phenomenon. The wonder will be how long he stays with the RLPO. I wonder what will happen when his extended contract runs out in 2015. I suspect that he will be able to go anywhere he wishes in the world - another Salonen, another Rattle – yet more. Meantime with every concert he affirms and extends Liverpool’s standing as 2008 City of Culture and its current bid to be England’s first UNESCO City of Music. Petrenko has recorded for Naxos but this is my first experience of Petrenko and Avie. It is all to the good that the music is close to my heart. Thus we have two fully mature works (Symphonic Dances and Isle of the Dead) in harness with the very early tone poem The Rock. The Symphonic Dances entwined me in the 1970s with a broadcast of Kondrashin's analogue recording with the Bolshoi Theatre Orchestra. On journeys between Torquay and Bristol I wore out the cassette in my primitive Philips cassette recorder hooked up Heath Robinson-style to a single speaker in my rust-ridden Morris 1100. I have heard a large number of fine and not so fine recordings of the work since. This however is masterly and it is stunningly recorded. The performance catches that fine balance between the lugubrious, the skull-haunted eschatology of mortality, romance that teeters on the edge of tears and the thrumming electricity of the dance. The saxophone is given its due in the soundscape as is the orchestral piano. Tension and mordancy have their place especially in the finale. I am not sure that this reading displaces 'my' Kondrashin as a reference point but it is very good - at least as good as the Polyansky originally on Chandos and latterly on Brilliant Classics. Temirkanov and the St Petersburg Orchestra, recorded by Warners a few years ago at the Proms, is also well worth hearing. Petrenko sets the seal on this version by observing the tam-tam laisser vibrer instruction in the score. The Avie's team's microphones play the effect up with lush and gloriously saturated indulgence. They seem to close in on the metallic decay so that we can relish every moment. While the groaning Dies Irae in the finale lacks a fully baleful inflection this is a very fine version indeed. The Isle of the Dead murmurs and undulates atmospherically. It lulls and chills. Again this is a very strong reading. As for The Rock, this early tone poem is redolent of Rimsky-Korsakov’s marine fantasies such as Sadko and the Glazunov tone poems including The Sea. It is a very poetic piece and despite knowing it well from the recording Previn made with the LSO during his RCA-1960s I found much that jumped forward with new impact in this superb reading and recording. It is the strongest version on disc – at least among the handful I know. I took to it like a duck to water and was impressed with the vertiginous Golovanov-like tempo Petrenko adopted. It’s a very exciting yet delicate reading of a work that could never be described as mature Rachmaninov. Yet it will appeal strongly if you enjoy Rimsky’s Sadko, Scheherazade and Antar; and then there’s a work you might never link with it: Bax’s Garden of Fand. Interesting that much of the occluded writing in the two mature pieces reminded me of Bernard Herrmann in the Rosebud/Xanadu scenes from Citizen Kane. Such a pity that Herrmann never got around to recording the Dances - I wonder if the work is in the CBS 1940s broadcast archives. Don’t miss out on the Kondrashin Dances –they’re now on Melodiya. Polyansky is also pretty good on an inexpensive Brilliant Classics duo (Dances, Isle, Bells and much more). However there is no competition with this exact coupling. Were you to be looking for a very healthy modern recording where the performances and sound vie with each other in excellence then this is certainly one to go for.